Grocery wishes will be the stuff that a robot army accepts as commands. An army of robots coordinated to get orders together fast could be a big part of the grocery future. "Travelling at four meters per second, the robots are programmed to locate items within the chilled and ambient temperature sections, before using a hook to grab its crate and deliver it to a human employee who packs it into a box." That is the way The Sun described the Ocado way of delivering modern technology to run operations as an online grocery leader. Forbes' Parmy Olson last year wrote about Ocado and called it " the world's largest online-only grocery chain." She said Ocado was part of the reason why people in the U.K. purchase more of their groceries online than those in any other country besides South Korea. Ocado, the online-only supermarket, is making news because of its highly automated warehouse design. That design features robots that exhibit swarm behaviors. They raise the bar on the pick-and-pack experience as a fast, efficient operation. 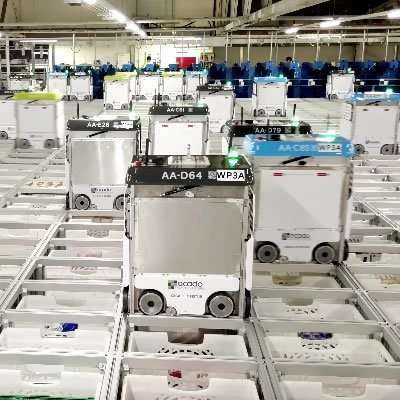 In a report from Reuters: "Ocado says Andover, powered by its own software and hardware, is the most advanced system for online grocery on the planet." The Andover reference is about its warehouse in Andover, UK, a technology showcase. "While boosting its own profitability," said Reuters, "it also functions as a shop window to potential customers." Bringing food to customers is a worthy discussion topic for supermarket planners and a number of players have turned to Ocado. Reports mentioned players in Europe and in Canada, that want eager to leverage the technology in a highly automated warehouse setting. Zoe Kleinman, BBC News, reported on Wednesday about her UK visit to an Ocado warehouse, the one in Andover. It processes customer orders and "doubles up as a sort of living robotics lab." Living lab? Kleinman saw "a robotic pick machine" refining its skills. It was practicing picking up items and putting them into boxes. "It is quite possibly their future." The warehouse to James Vincent, The Verge, looked like "a huge chessboard, populated entirely by robots. There are more than a thousand of them, each the size and shape of a washing machine, and they wheel about, night and day, moving groceries." The challenge of running a warehouse with robots for any kind of business is quite admirable but what adds distinction here is that one is talking about a company in the business of handling food. Parmy Olson quoted the CTO Paul Clarke: " If you can do online grocery, you can do other kinds of online retail," says Clarke. "The reverse doesn't follow." The process? Kleinman, BBC News, said, "The robots, complete with green flashing lights, are collecting crates of food that sit in stacks beneath the grid and delivering them to chutes, where human workers beneath take the number of items they need to complete an order and then the crates are lifted back by the machines and returned to their spot." Vincent noted how "human employees grab the items they need from the crate (a screen in front of them tells them what to take.)" Bethan Grylls in New Electronics: The robots glide across the grid made up of stacks of boxes lowered and raised based on needs. "The robots act as a goods-to-person system, bringing crates of products from storage to pick stations where personal shoppers – either human or robotic – assemble customer orders by transferring products from storage into customer bags." The robots are also tasked, Grylls said, with replenishing the storage structure "by grabbing crates full of products from an area on the side of the grid and placing then back into the grid." Kleinman said, "each box is home to a different sort of grocery, and the crates sit in piles." Vincent added that "Items are still placed in crates, but those crates are now stored in huge stacks, up to 17 boxes high. Their position in this stack seems to be at random—a box of razors next to cod fillets, for example—but it's algorithmically decided; with frequently accessed items placed on the top and rarer purchases near the bottom. On top of this hoard, the robots do their work." The robots, with 4G capability, are in swarm mode and they collaborate like a swarm of insects. They can pull together orders in minutes. If one of the robots get "sick," another robot can take its place. They are quick, up to 4m per second (8.9 mph), said Kleinman, able to pass within 5mm (0.2in) of each other. The Verge described how a group of robots huddle, split up, and pick the order in minutes. "In a traditional warehouse where items are scattered around on distant shelves, this process can take hours." Moving forward, the plan is to have an operation able to process around 65,000 orders every week. Online grocery retail is expected to grow at a double-digit rate globally up to 2020, according to research firm IGD, said the article by Olson, and that could help drive demand for automated warehouse systems like Ocado's.